Is it time for Cameron to try a new tack with BRICS? Editor’s note: This piece was written and posted before David Cameron’s decision to postpone his original plan to deliver the speech in Amsterdam on January 25, it was slightly edited to remove the original time references. Nature, they say, abhors a vacuum and nowhere is this more true than in the world economic pecking order. While there is no doubt that the decline of the Eurozone and the fiscal profligacy of the US has left the door open to China and the rest of the BRICS group to take the moral and financial high ground, there is little sign of these two former economic super-powers doing anything truly positive to retrieve their former strength. The politicians on Capitol Hill seem determined to drive the US over the fiscal cliff because their irrational mutual hatred will not let them sit down like adults and work out a sensible way to reduce the country’s burgeoning $16 trillion debt. Things are not much better in Europe where the matriarchal figure of Angela Merkel stands over the squabbling Greeks and idolentary Italians as they continue to spend beyond their means despite having said they will face up to their economic responsibilities as members of the Eurozone. Standing on the sidelines, the UK’s Conservative leaders are enjoying the schadenfreude of the Eurozone’s troubles, happily using Brussels as a whipping boy for their own domestic difficulties as their austerity measures really begin to bite at home. With everyone in the European Union trying desperately to make out any discernible signs of an economic upturn, some would argue that it is exactly the wrong time to re-open some of the Britain’s oldest political wounds by revisiting some of the thorniest issues in the history of the EU. However, that is precisely what will happen when David Cameron, the British Prime Minister, eventually delivers what many commentators have described as one the most difficult speeches of his premiership. It is a speech that has been months in gestation, and the actual date of delivery has changed many times, but despite that, the PM will try to articulate his vision for Britain’s place in a rapidly-changing Europe. The speech itself remains a closely-guarded secret and Cameron, not wanting to upset his own party, has given little away, although many think he will call for an opt-out of some EU laws and lay the ground for a UK referendum on the future of Britain’s membership of the European club. Commentators of all colours have had a field day giving Cameron advice about what he should or should not say. The speech will be keenly watched at home, where the usual suspects on both sides of the UK’s European divide are poised to pick over every syllable for signs of that referendum, and whether it will be over whether Britain should be in or out of something, whether that be the Euro, the Working Time Directive or the whole EU itself. Meanwhile the rest of Europe will be holding its breath, waiting to see whether Cameron will come out fighting like Margaret Thatcher did in Bruges, in which case the battle will be joined, or they will be looking for signs of weakness in the British stand against getting further embroiled in the Grand Experiment of deeper political and economic union. The pressure on Cameron does not end at the EU’s borders either, after the US said they wanted the UK to be in Europe, giving them ‘someone they could deal with’ – with the State Department’s attempts at international diplomacy now having become as subtle as a sledgehammer, one might forgive Cameron for wondering if he still really wanted friends like that any more. In reality though, very few people expect Cameron’s speech to make much difference in the short term; it seems it will be more about laying down a statement of intent and keeping the tenuous sticking plaster of unity over his own party until after the next General Election in 2015. Between now and then, however, Europe will be changing, rapidly and profoundly; not by choice, but desperately and entirely out of necessity. The Germans want greater political union, and everyone inside the Eurozone accepts that if it is to survive, there must be tighter fiscal integration. With that process underway, and assuming Cameron wins the next election, he will very likely find little room to manoeuvre. Any attempts to repatriate powers to Westminster, especially in the areas of criminal justice and employment are likely to get washed away in the wake of a European Union that is bolting towards closer integration as if its life depended on it. The good news for the BRICS countries is that Cameron’s speech probably represents nothing more than business as usual in Europe, Britain and the US, all of whom are focussed on their own survival and whose levels of debt mean that the only rational course of action is austerity measures and the vain hope of a slow recovery. 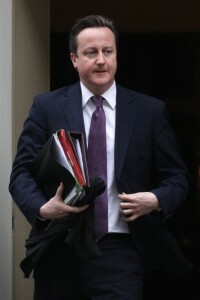 Like Cameron’s search for a “fresh settlement” of Britain’s role in Europe, the recovery will be slow and hard. Meanwhile with China creating wealth with the equivalent of four Greeces a year, and the BRICS creating the equivalent of a new Italy (the world’s eighth largest economy) at the same time, according to the Huffington Post, the woes of the old guard are an opportunity for BRICS to take the initiative, and forge ahead with their plans for growth and greater economic partnership. For Cameron, the strategy of revisiting Britain’s relationship with Europe is a piece of very public political masochism which seems completely at odds with the circumstances. Europe is about to throw itself into top gear and put its foot down on the integrationist accelerator, even the most skillful mechanic would be hard-pressed to re-build the engine with the car moving at high speed. Instead of publicly flagellating himself, it might be better for Cameron to bide his time and see what shape Europe is in after the election, and then see whether a “fresh settlement” can be reached, or indeed, whether one is necessary. Who knows? The new Europe may be so radically different; there could be clear signs of whether integration was a step too far or not, and with a referendum depending on a “fundamental” change, the choices on offer may be much more stark. With all that potentially in the future, Cameron and his coalition partners might do better to work out what the UK needs to do to get its businesses in position to take advantage of the growth coming out of China and the rest of the BRICS powers, rather than just re-opening old battles with potential economic has-beens. Russell Merryman is a senior lecturer in journalism and digital media at the London College of Communication and former editor-in-chief of Al Jazeera online, prior to which he was a broadcast/multimedia journalist and editor at the BBC. He is also a contributing editor for The BRICS Post.